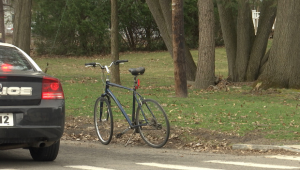 Second Elmira Bicyclist Struck By Car This Week; Drivers, Share The Road and Pay Attention! I am sad to report that another Elmira bicyclist was struck by another careless motorist who simply wasn’t paying attention and struck a bicyclist while making a turn. 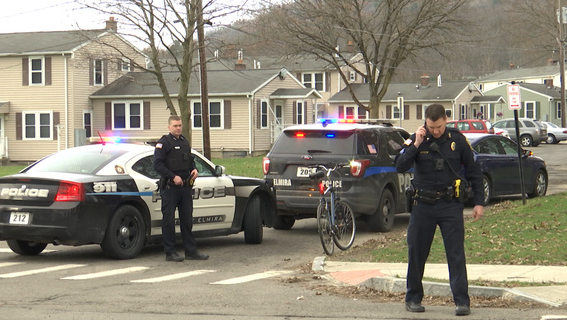 At about 7:30 a.m. Friday, a motorist struck a male bicyclist, identified as a man in his 50s, at Roe Avenue and Hoffman Street on Elmira’s Northside, about one city block from Arnot Ogden Medical Center. The driver was turning right from Hoffman Street into Roe Avenue when they struck the bicyclist. Fortunately, the bicyclist suffered non-life-threatening injuries, police said. The driver was ticketed for Failure to Use Due Care For a Bicyclist, police said. Drivers are legally required to share the road with other vehicles, bicyclists, and pedestrians. It is NOT an excuse to say, “I didn’t see the bicyclist” or “I didn’t notice the pedestrian in the crosswalk.” As a driver, it’s your legal DUTY to be observant and see what is there to be seen. So, please, when driving, be on the outlook for bicyclists, walkers, joggers, kids on skateboards. Paying attention saves lives …. 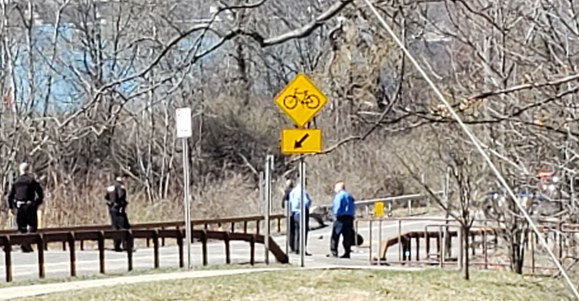 On Tuesday afternoon, bicyclist Charles G. Rogers, 68, of Elmira, was struck and killed in a crosswalk by a drunk hit-and-run driver on Grand Central Avenue in Elmira near the Clemens Center Parkway Extension and the north entrance to Eldridge Park. The driver of the vehicle, who police said was drunk at the time of the crash, was stopped by Elmira Heights police after fleeing the scene. Sara Harnas, 40, of Elmira Heights, is facing two felony charges – first-degree Aggravated Unlicensed Operation and Leaving the Scene of a Fatal Accident. Her license has been suspended six times, police said, and she did not own the car she was driving at the time of the accident. A Chemung County grand jury will decide whether Harnas faces additional charges, police said. In Friday morning’s crash, news reports said the driver of the 2016 Ford sedan, who was not identified by police, was traveling south – in the same direction as the unidentified bicyclist – when the sedan hit the bicyclist. The bicyclist was transported to Arnot Ogden Medical Center with non-life-threatening injuries, police said. Police are asking witnesses to contact the Elmira Police Department at 607-737-5626 or the anonymous tip line at 607-271-HALT. This entry was posted in Bicycle Accident Cases in Court, Bicycle accident lawsuits, Bicycle Accidents, Bicycle crashes, Bicycle Safety, Bike accident lawsuits, Bike accidents, Bike collisions, Bike crashes, Elmira bike accidents, Fatal bicycle accident, Hit-and-run accidents, Risks for Bicycle Riders, Uncategorized and tagged accident attorney, accident lawyer, Bicycle, bicycle accident, bicycle accident attorney, bicycle risks, Bicycle Safety, bike accident, Cycling, Elmira, Elmira New York, Injury, James B. Reed, Jim Reed, Lawsuit, New York bicycle accident lawyer, ny bicycle accident, ny bicycle accident lawyer, ny bicycle cases, pa bicycle accident, pa bicycle accident lawyer, pa bicycle law, Twin Tiers, Ziff Law Firm on April 13, 2019 by Jim Reed. The recent fatal bike crash in Elmira revealed the worst of humanity and the best of humanity. The worst in a woman, in the middle of the day, who was extremely drunk. Who drove her car drunk. Who ran down an adult bicyclist in a crosswalk. Who left that poor man to die while she sped away while holding her crushed windshield. Who tried to evade a brave hero who was chasing her as she tried to escape responsibility. The best in a brave citizen, simply driving home from work, who saw a car with a crushed windshield and a man lying on the road next to a crumpled bicycle, who didn’t hesitate for a second, who made a quick U-turn and chased after the car. Who called 911 while following that car until police arrived. We have nothing more to say about the horrible drunk, but we did want to take the time to applaud and publicly thank Jimmy Melton of Waverly. who was the brave good Samaritan. The world needs more people like Jimmy who are willing to get involved and help when unspeakable tragedies occur. Our law firm sponsors a Hero of the Game at each home game of the Elmira Pioneers and it is our hope to honor Jimmy with a special tribute at a Pioneers game this summer. In the meantime, to Jimmy, we simply say thanks for being a local hero. This entry was posted in Bicycle Accident Cases in Court, Bicycle accident lawsuits, Bicycle crashes, Bicycle Laws, Bicycle Safety, Bike accident lawsuits, Bike accidents, Bike collisions, Bike crashes, Elmira bike accidents, Fatal bicycle accident, Hit-and-run accidents, New York Bicycling Coalition, Risks for Bicycle Riders, Uncategorized and tagged accident attorney, accident lawyer, Bicycle, bicycle accident, bicycle accident attorney, bicycle risks, Bicycle Safety, bike accident, Cycling, Elmira, Elmira New York, Injury, James B. Reed, Jim Reed, Law, Lawsuit, New York bicycle accident lawyer, ny bicycle accident, ny bicycle accident lawyer, ny bicycle cases, pa bicycle a, pa bicycle accident, pa bicycle accident lawyer, pa bicycle law, Traffic collision, Twin Tiers, Ziff Law Firm on April 12, 2019 by Jim Reed. 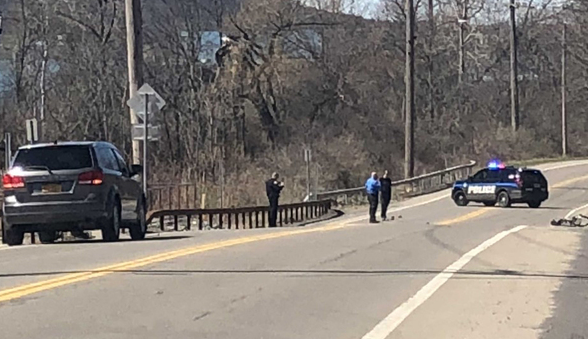 Charles G. Rogers, a 68-year-old bicyclist from Elmira, was struck and killed by a hit-and-run driver with a suspended license Tuesday afternoon on Grand Central Avenue in Elmira, police said. Mr. Rogers was crossing in the crosswalk on Grand Central near the Clemens Center Parkway Extension, close to the north entrance to Eldridge Park, at about 2 p.m. Tuesday when he was struck by a northbound 2006 Ford Fusion driven by Sara Harnas, 40, of East 11th Street in Elmira Heights, according to Elmira police. He was transported by Erway Ambulance to Arnot Ogden Medical Center in Elmira, where he died a short time later, police said. Ms. Harnas initially fled the scene and was only apprehended by the swift and brave action of a witness who followed her while calling 911. She was taken into custody by Elmira Heights police officers on East 14th Street in Elmira Heights near Lake Road. Ms. Harnas allegedly was highly intoxicated. Alcohol and drug tests are pending. Her driver’s license has been suspended six times, police said. Ms. Harnas was charged with Leaving the Scene of a Fatal Accident and First-Degree Aggravated Unlicensed Operation, both felonies, and arraigned on Tuesday night in Elmira City Court and sent to the Chemung County Jail, police said. The investigation continues and additional charges are expected, police said. As a member of the Elmira bicycling community, my heart goes out to the family of Charles G. Rogers. As a local bicycle advocate and Board member on the NY Bicycling Coalition, I will be working with our biking community to ensure that this reckless drunk driver is prosecuted to the fullest extent of the law. We thank the wonderful citizen who followed the hit-and-run driver until the Elmira Heights police pulled Ms. Harnas over. Of course, more details will emerge as the Elmira Police Department completes its investigation, but it is our hope that this drunk driver will be prosecuted to the fullest extent of the law. In the meantime, again, our condolences to Mr. Rogers’ family and friends. This entry was posted in Bicycle accident lawsuits, Bicycle Accidents, Bicycle Collisions, Bicycle crashes, Bicycle Laws, Bicycle Safety, Bike accident lawsuits, Bike accidents, Bike collisions, Bike crashes, Elmira bike accidents, Fatal bicycle accident, Hit-and-run accidents, Risks for Bicycle Riders, Uncategorized and tagged accident attorney, accident lawyer, Bicycle, bicycle accident, bicycle accident attorney, bicycle risks, Bicycle Safety, bike accident, Cycling, Elmira, Elmira New York, James B. Reed, Jim Reed, Lawsuit, New York bicycle accident lawyer, ny bicycle accident, ny bicycle accident lawyer, ny bicycle cases, pa bicycle accident, pa bicycle accident lawyer, pa bicycle law, Twin Tiers, Ziff Law Firm on April 10, 2019 by Jim Reed. Carbon Fiber Bikes and Components: Great or a ticking time bomb? It’s worth reading a great new article by Eric Barton in Outside magazine, “Why Carbon Fiber Bikes Are Failing,” because he writes a balanced account about what’s happening with these bikes. There are more and more lawsuits nationwide every day because of components failing on aging bikes, poor quality production, and more. I own two carbon-fiber bikes: a Trek Madone road bike and a Giant mountain bike because I love riding lightweight bikes. And I have also represented two carbon fiber bike owners who suffered catastrophic injuries in crashes where carbon fiber components failed, and have heard of many other similar cases because I am a Bike Law lawyer in New York. Carbon fiber is not always a dangerous material for bikes. If manufactured properly and professionally inspected for wear and tear, carbon bikes and components can be safe. 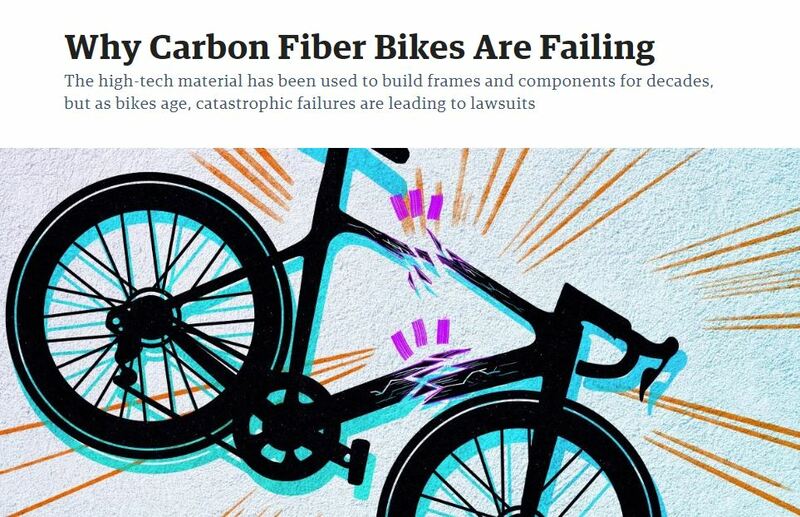 But this is the problem: not all carbon fiber bike makers and component makers have the necessary high production standards, and many owners can’t tell when key parts are in danger of failing because they are not able to do the kind of inspection professionals can do. It is the hidden dangers of carbon that can bite you….. So word to the wise….. have your carbon fiber bike and components regularly maintained and serviced by experienced bike mechanics who are trained to properly install components following manufacturer recommended torque settings and who can carefully inspect for early signs of carbon damage or failure. 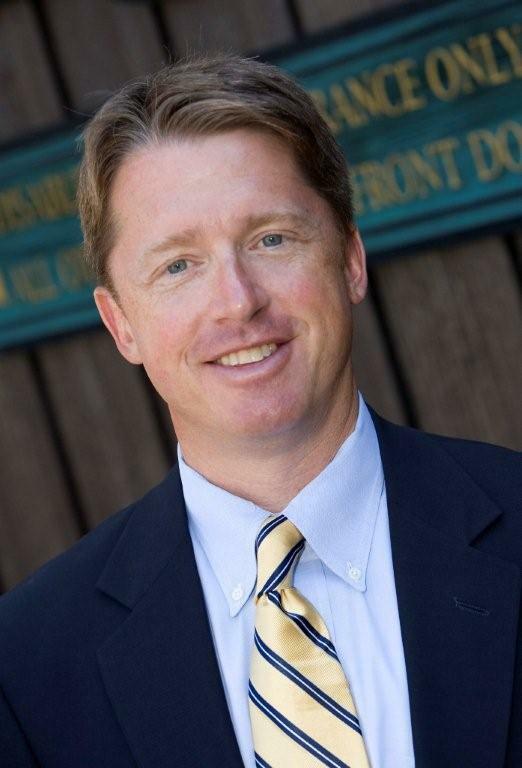 Attorney James B. Reed is a New York state representative of Bike Law and has handled two lawsuits where clients suffered catastrophic injuries when carbon-fiber components failed below them. He has heard about numerous others from people on the Bike Law listserv. Reed and other experts in carbon fiber agree that any material can fail. Wrecks happen from faulty aluminum, steel, and even rock-hard titanium. The difference with carbon fiber is that it can be difficult to detect signs of damage that might signal imminent failure. Cracks and dents in other materials are typically easy to see, but fissures in carbon fiber often hide beneath the paint. What’s worse is that when carbon fiber fails, it fails spectacularly. While other materials might simply buckle or bend, carbon fiber can shatter into pieces, sending riders flying into the road or trail. 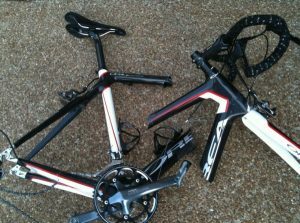 And this kind of catastrophic destruction can happen to any part of a bike made with the material. Carbon fiber used to be used only in expensive bikes, but now it’s used in many bikes, and crashes that follow part failures are on the rise, and based on the court ruling in Illinois, more lawsuits are likely on the way related to carbon-fiber bike parts. Roman F. Beck, another bicycle-accident forensic expert, warns of the long-range implications of bike makers using carbon fiber material, including mountain bike companies, especially now that there are so many secondhand bikes on the market. This entry was posted in Bicycle Accident Cases in Court, Bicycle accident lawsuits, Bicycle Accidents, Bicycle Collisions, Bicycle Laws, Bicycle Safety, Bike accident lawsuits, Bike accidents, Bike collisions, Bike manufacturers, Elmira bike accidents, Uncategorized and tagged accident attorney, accident lawyer, Bicycle, bicycle accident, bicycle accident attorney, bicycle risks, Bicycle Safety, bike accident, Cycling, Elmira, Elmira New York, James B. Reed, Jim Reed, Law, Lawsuit, New York, New York bicycle accident lawyer, ny bicycle accident, ny bicycle accident lawyer, ny bicycle cases, pa bicycle accident, pa bicycle accident lawyer, pa bicycle law, Twin Tiers, Ziff Law Firm on July 30, 2018 by Jim Reed. 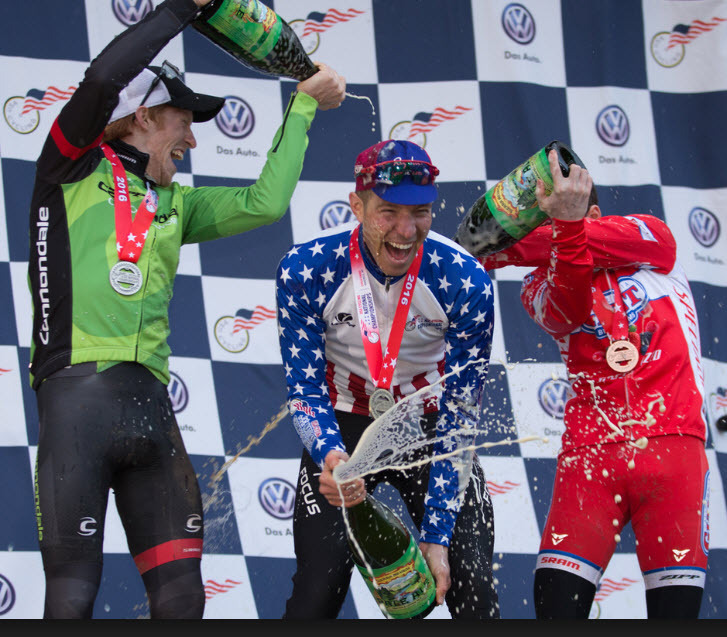 There is some very big news in the U.S. cycling world today. increased awareness of cycling laws, legal reform and advocacy. As a proud member of USA Cycling, I can’t wait to see the synergy created by the Bike Law/USAC partnership. 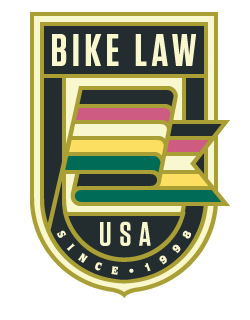 I am one of two New York State attorneys in the Bike Law network. 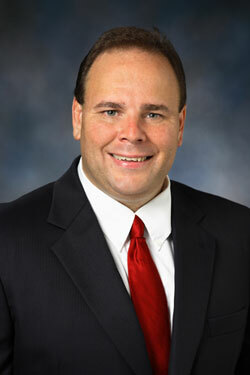 I am available to represent New York and Pennsylvania bicyclists and their families. Bike Law, has lawyers representing cyclists and advocating for cycling safety across the United States and Canada. Priority initial consultation with a bike attorney within 24 hours and at no charge. Reduced fees in bicycle crash cases for members. Ongoing consultation for clubs on organizational legal issues at no charge. Speaking engagements on bicycle law to clubs at no charge. Priority consideration for pro bono legal representation by the Bike Law Defense League to advance cycling justice. Join USA Cycling today to support a great organization and join the fight to help make our roads safer! USA Cycling has recently added a Ride Membership for those cyclists who love to ride but have no desire to race. This entry was posted in Bicycle Accident Cases in Court, Bicycle accident lawsuits, Bicycle Accidents, Bicycle Collisions, Bicycle Laws, Bicycle Safety, Bike accident lawsuits, Bike accidents, Bike collisions, Elmira bike accidents, Fatal bicycle accident, Uncategorized and tagged accident attorney, accident lawyer, Bicycle, bicycle accident, bicycle accident attorney, bicycle risks, Bicycle Safety, bike accident, Cycling, Elmira, Elmira New York, James B. Reed, Jim Reed, Lawsuit, New York, New York bicycle accident lawyer, New York City, ny bicycle accident, ny bicycle accident lawyer, pa bicycle a, pa bicycle accident, pa bicycle accident lawyer, pa bicycle law, Twin Tiers, Ziff Law Firm on January 27, 2017 by Jim Reed. I recently received a question from an Elmira College student, who raised a very interesting – and often misunderstood – issue: bicycling while intoxicated. Can riders be arrested like motorists? I have heard this before, and have witnessed family and colleagues get arrested for driving their cars while intoxicated. The consequences have been devastating emotionally, financially, and socially. I expect bicycling will get more popular and become a necessity for some riders, so I envision our nation’s bicycling infrastructure will continue to grow in the future. What is the current law in New York State? As an avid cyclist, former President of the NY Bicycling Coalition, and Elmira bike crash lawyer, I can tell you that while bicycling while intoxicated is NOT a good idea, it is incorrect that you can be charged with BWI (Bicycling While Intoxicated in NY). Accordingly, if you are riding a bicycle, skateboard or any other non-motorized vehicle and have had one too many drinks, you cannot be charged with BWI. However, as with all laws, some exceptions do apply. If you have altered your bike by installing a motor, you will not be exempt from New York DWI laws. In addition, just because you are exempt from DWI laws when drinking and biking, does not mean that you will not face misdemeanor charges, such as public intoxication or some other form of public endangerment. Although these involve lesser charges with relatively minor punishments, they will nevertheless result in court costs and additional fines. But as I said, if you choose to drink, the best policy is to err on the side of caution and not ride your bicycle in order to avoid any potential legal trouble and danger to both your own health and those of others on the road. Thanks for reading, and please ride sober! This entry was posted in Bicycle Accident Cases in Court, Bicycle accident lawsuits, Bicycle Accidents, Bicycle Collisions, Bicycle Laws, Bicycle Safety, Bike accidents, Bike collisions, Elmira bike accidents, Risks for Bicycle Riders, Uncategorized and tagged accident attorney, accident lawyer, Bicycle, bicycle accident, bicycle accident attorney, bicycle risks, Bicycle Safety, bike accident, Cycling, Driving, Elmira, Elmira New York, James B. Reed, Jim Reed, New York, New York bicycle accident lawyer, ny bicycle accident, ny bicycle accident lawyer, ny bicycle cases, pa bicycle accident, pa bicycle accident lawyer, pa bicycle law, Twin Tiers, Ziff Law Firm on January 5, 2017 by Jim Reed. 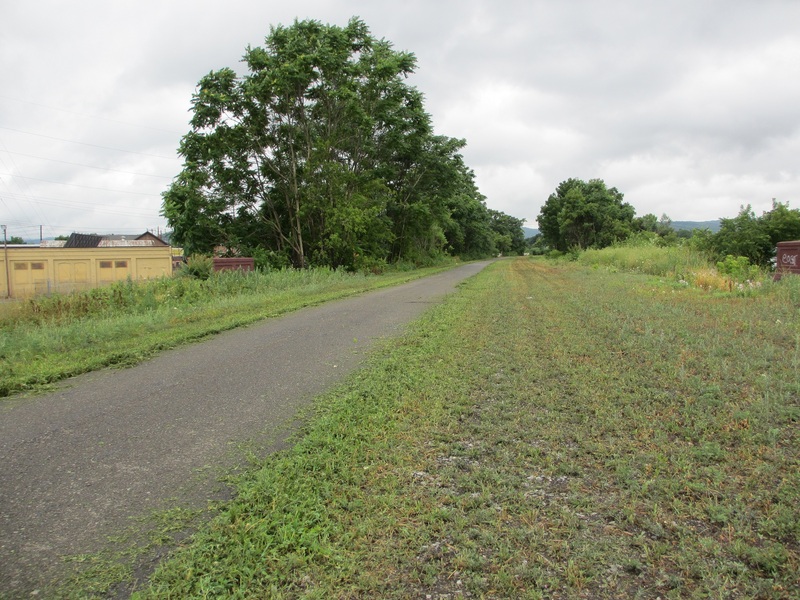 Chemung County and the City of Elmira want to build on the success of their Lackawanna Rail Trail (above and below) by building a path that links Elmira and Big Flats. Twin Tiers bicyclists who have been seeking a safe bicycle route from downtown Elmira to the shopping areas in Big Flats can learn more and speak out starting Tuesday at one of two community meetings on a proposed bicycle path’s three routes. 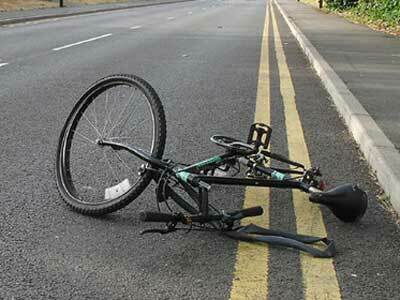 Many people say they would love to ride their bikes but they are concerned about the dangers of riding on the road. (And no one wants to ride a bike on the Miracle Mile!) Dedicated bike trails give these people a safe, secure place to ride their bikes. Also, these trails are a wonderful place to teach children how to safely ride their bikes. Of the three proposed routes, it is Route 3 that Elmira-Chemung Transportation Council transportation analyst Mike Perry told the Elmira Star-Gazette is the best and safest choice. It takes bicyclists along David Street to Oakwood Avenue in Elmira Heights to Grand Central Avenue in Horseheads. The first meeting is the Tuesday meeting of the Southern Tier Bicycle League at 3 p.m. at 400 E. Church St., in the Chemung County Chamber of Commerce at the Lake Street intersection. Learn more about the proposals here. If you miss Tuesday’s meeting, the transportation council’s Bicycle Advisory Committee and Pedestrian Advisory Committee meet at 10 a.m. April 15, also in the chamber offices. 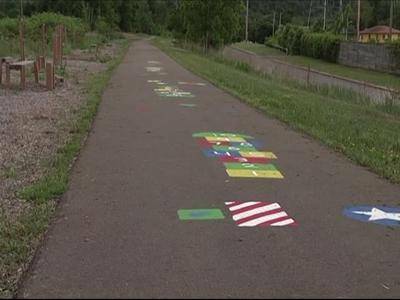 The Elmira-Chemung Bicycle Pedestrian Trail 2035 Plan, a study finished a year ago, used community ideas to establish a network of bicycle- and pedestrian-friendly routes. Route 1, the Miracle Mile, would cost $4,116,000 to build. Route 2, which follows Madison Avenue, Lake Street and Main Street, would cost $849,000. Route 3 would cost $793,000. If Route 3 is selected, there will be a lot of work to be done. A railroad crossing in Elmira Heights would need work. A culvert on Upper Oakwood Avenue would have to be wider. Grand Central Avenue near Interstate 86 would need to be wider, too, as well as the shoulders on Sing Sing Road, Colonial Drive and Arnot Road. Construction could begin as soon as sometime in 2017, transportation officials said. I would encourage area bicyclists to get behind the project and learn more about it. A SAFE bike and pedestrian path connecting Big Flats and Elmira would benefit all parts of the county! Thanks for reading — and please get involved by learning more about the options and speaking out! This entry was posted in Bicycle commuters, Bicycle commuting, Bicycle Safety, Cool Stuff for Bicyclists, Elmira bike accidents, Southern Tier Bicycle League, Uncategorized and tagged accident attorney, accident lawyer, Bicycle, bicycle accident, bicycle accident attorney, bicycle risks, Bicycle Safety, bike accident, Cycling, Elmira, Elmira New York, James B. Reed, Jim Reed, New York bicycle accident lawyer, ny bicycle accident, ny bicycle accident lawyer, ny bicycle cases, pa bicycle accident, pa bicycle accident lawyer, pa bicycle law, Twin Tiers, Ziff Law Firm on March 28, 2016 by Jim Reed. At Long Last, A Simple Law To Save Bicyclists’ Lives — Proposed 3-Foot Passing Law For NY! If you could change just a few words in an existing law to make it safer for every person in NY to ride their bikes, wouldn’t you do it? If the change in the law wouldn’t cost a penny but would save millions of dollars a year, wouldn’t you do it? As President of the New York Bicycling Coalition (NYBC), I am pleased to announce that NYBC has secured support in both the New York State Assembly and Senate for a new 3-foot passing law in NY. Here is the Senate and Assembly bills. My personal thanks to New York Senator Tom O’Mara, who agreed to be the lead sponsor for this important law in the Senate, and to Assemblyman Phil Palmesano, who agreed to co-sponsor the Assembly bill. It is so nice to know our local legislators truly care about cycling safety in NY. But now comes the hard part, and this is where we can use your help. We need concerned, caring bicyclists to reach out to their local legislators to ask that they please support this important law. We need people to visit, write and email their legislators. We need legislators across NY to know about this important law and to know it matters to all NY cyclists. NYBC will be teaching its members across the state how to support this new law. If you are interested in helping this effort, please join NYBC today. Memberships start at just $35 but if you can’t swing that amount, email me at [email protected] and I will get you on the NYBC mailing list so your voice can be heard. Let’s bring New York State law into the 21st century. Let’s save lives and save money. Let’s send a message that New York is serious about creating a safe and shared road system throughout our great state! This entry was posted in Bicycle accident lawsuits, Bicycle Accidents, Bicycle Collisions, Bicycle Laws, Bicycle Safety, Bike accident lawsuits, Bike accidents, Bike collisions, Elmira bike accidents, Fatal bicycle accident, New York Bicycling Coalition, Risks for Bicycle Riders, Uncategorized and tagged accident attorney, accident lawyer, Bicycle, bicycle accident, bicycle accident attorney, bicycle risks, Bicycle Safety, bike accident, Cycling, Elmira, Elmira New York, James B. Reed, Jim Reed, Law, Lawsuit, New York, New York bicycle accident lawyer, ny bicycle accident lawyer, ny bicycle cases, pa bicycle accident, pa bicycle accident lawyer, Twin Tiers, Ziff Law Firm on February 5, 2016 by Jim Reed. Attorney Jim Reed, managing partner of the Ziff Law Firm, was recently elected president of the board of the New York Bicycling Coalition (NYBC), a group that advocates for a safer New York state for bicyclists. Jim is passionate about bicycling and will help NYBC grow and reach more riders across the state. He will be a game-changer for NYBC! 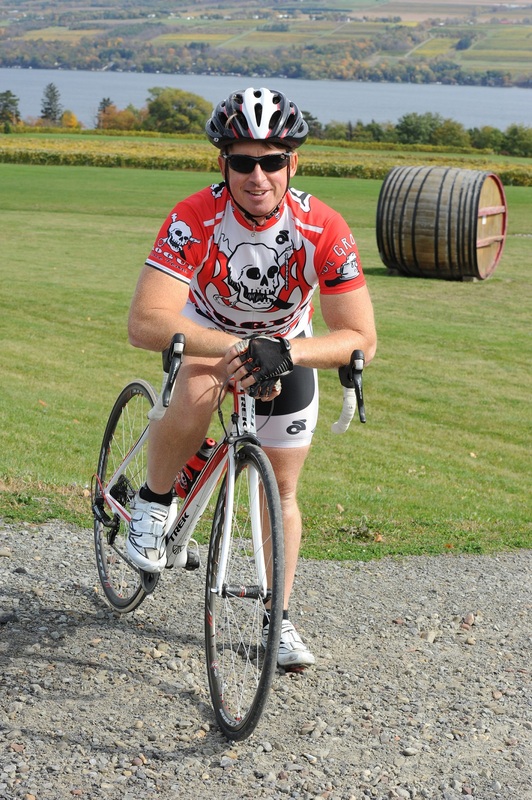 Jim, who has been on the NYBC board for four years, has been an avid cyclist since he was a teenager. He participates in all kind of cycling, including road racing, mountain biking, bike trips and recreational riding. The New York Bicycling Coalition advocates in Albany and across the state for better transportation policies, more funding, and educating about bicycle safety, the benefits of riding, and treating riders with respect. 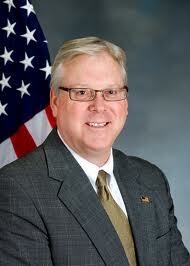 NYBC welcomes Reed’s energy and passion for safety. If you are interested in supporting the important mission of NYBC you can join here: www.nybc.net/join. This entry was posted in Bicycle Accident Cases in Court, Bicycle accident lawsuits, Bicycle Accidents, Bicycle Collisions, Bicycle Laws, Bicycle Safety, Bike accident lawsuits, Bike accidents, Bike collisions, Elmira bike accidents, Fatal bicycle accident, Hit-and-run accidents, New York Bicycling Coalition, Risks for Bicycle Riders, Uncategorized and tagged accident attorney, accident lawyer, Bicycle, bicycle accident, bicycle accident attorney, bicycle risks, Bicycle Safety, bike accident, Cycling, Elmira, Elmira New York, Injury, James B. Reed, Jim Reed, Lawsuit, New York, New York bicycle accident lawyer, ny bicycle accident, ny bicycle accident lawyer, ny bicycle cases, Personal injury lawyer, Twin Tiers, Ziff Law Firm on November 16, 2015 by Jim Reed. A safe bicycle passing law in New York State designed to make it safer for bicyclists and motorists to share the road is too vague and hard to enforce. Merrill’s Law, passed by the state Legislature in June 2010, requires motorists to pass bicyclists at a safe distance to prevent accidents. 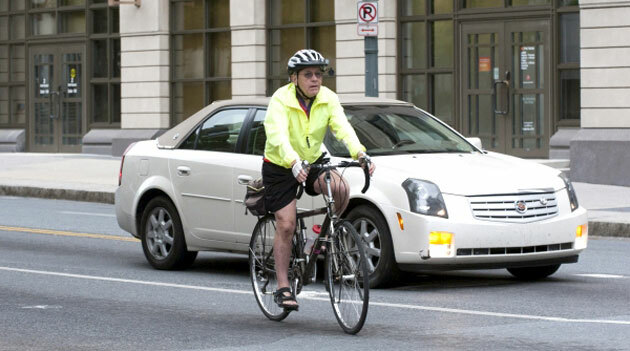 The law was named in honor of Merrill Cassell of Hartsdale, a safe bicycling advocate who was struck by a passing public bus and killed in 2009. The bus driver was never charged. A recent story in a downstate newspaper, published on the fifth anniversary of Merrill’s death, shared the sad news: bicyclists don’t feel safer and police across the state are writing few tickets for safe passing violations. Law enforcement professionals say the law is almost impossible to enforce. In this 2010 blog post, I said I was happy to see the law pass but I was critical of the wording, calling it too vague to enforce. I was right. Because what constitutes a “safe distance” is not clearly defined under the current NY safe passing law, the legal distance is subject to interpretation. Frankly, I much prefer the safe passing law of at least 24 other states who list a specific, objective “safe passing” distance like 3 feet, 4 feet or more. I prefer this objective standard because I think it is easier for prosecutors to prove an objective, concrete distance like 3 feet rather than argue about what might have been safe under the circumstances. I have long believed the NY safe passing law is virtually worthless because of the difficulty of determining legally what constitutes a “safe distance” for a motorist to pass a bicyclist. Because of this ambiguity, many police officers have told me off the record that they won’t write tickets for violating this law unless there is an actual collision. And at least one local DA has told me the same thing. So what good is a law that law enforcement won’t enforce? No good. Because of the lack of enforcement of our current law, I have spent many hours advocating for NY to adopt a 3-foot passing law. I think 3 feet is easy to enforce because that’s the length of a yardstick that hangs in virtually every elementary school classroom I have ever been in. For sports fans, one yard is one of those hashmarks on the field every time you tune into a football game. For a person of average height, 3 feet is their approximate arm length. 1122-a of the Vehicle and Traffic Law of the State of NY: Overtaking a bicycle. Would 3 feet be a safe passing distance? Or do you prefer 4 feet, or more? This entry was posted in Bicycle Accident Cases in Court, Bicycle accident lawsuits, Bicycle Accidents, Bicycle Collisions, Bicycle Laws, Bicycle Safety, Bike accident lawsuits, Bike accidents, Bike collisions, Elmira bike accidents, Fatal bicycle accident, Risks for Bicycle Riders, Uncategorized and tagged accident attorney, accident lawyer, Bicycle, bicycle accident, bicycle accident attorney, bicycle risks, Bicycle Safety, bike accident, Cycling, Elmira, Elmira New York, James B. Reed, Jim Reed, Law, Lawsuit, New York, New York bicycle accident lawyer, ny bicycle accident, ny bicycle cases, pa bicycle accident, pa bicycle accident lawyer, pa bicycle law, Twin Tiers, Ziff Law Firm on January 13, 2015 by Jim Reed.